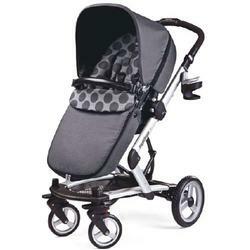 Peg Perego Skate Baby Stroller - Free Shipping! With the Skate, you get everything you need for traveling with little ones. It's a stroller…and a carriage…and a bassinet! The complete package includes our high-quality aluminum frame and the convertible central component that transforms to either the stroller seat or the carriage bassinet. The Skate System is designed for those who seek quality, safe materials, all–Italian production and innovative design: the very values to which Peg Perego aspires in manufacturing its products. 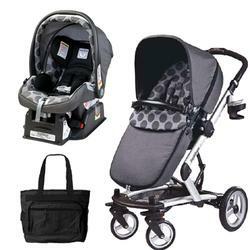 This 3 piece system transposes easily to an ultra comfortable pram or a reversible full functional stroller. High performing chassis with modular piece height adjustments, cup holder, centralized brake, suspension and ball bearings, basket/carry–all with handles and height adjustable handle bar all enhance the functionality of the stroller seat and pram. The reversible stroller seat can face forward or backward, with multiple position "Tilt–n–space" recline. The pram is free standing with adjustable backrest for comfort. The hood and boot maybe used with either the ultra comfortable pram or the reversible, highly functional stroller. The Skate system easily converts into a travel system. The Primo Viaggio SIP 30-30 (sold separately) attaches directly to the chassis, using the included car seat adaptors. Moving your child from the car to the Skate chassis is a simple click and off you "Skate" to the store. Primo Viaggio SIP 30-30 adaptors. Hood and boot can be used on stroller seat or bassinet. Stands alone and has convenient carrying handle; can be used as a portable bassinet. Backrest with easy–to–reach exterior adjustment. 3 position height adjustment on chassis. Utilize full hood and zippered boot. Reverses to face forward or back. Travel System compatible — our Primo Viaggio SIP 30-30 car seat (sold separately) attaches easily with included adapters. New large–capacity removable, collapsible shopping basket with handles. Wheels designed with ball bearings and shock-absorbing springs. Easy to open or close (with or without stroller seat attached). Push handle with multi–position angle adjustment and detachable Large–capacity bottle holder.